For the past week I decided that I would use Google Chrome as my default browser and I must say that I’m impressed. It is fast, stable and supports many (not all) of the little add ons that I use. I use a site on a daily basis that is very heavily Java based and I gotta say that here it really flys, even compared to Firefox. So I’m now using Chrome everyday without hesitation. Interestingly, I came across this news report “Calls to ditch Internet Explorer after China hacks” that details how the recent major cyber attacks against Google were perpetrated via Internet Explorer and Adobe Acrobat. Internet Explorer has had a really bad name in relation to security and even with the release of version 8 it doesn’t seem to be getting any better. Again, you do need to take these reports with a pinch of salt being they come from mainstream media (read techno-illiterate and sensationalism seeking) and are about a competitor to Google (i.e. Microsoft). However, the most interesting thing is that I haven’t seen much response from Microsoft about the attacks (Did they also get attacked? If they didn’t why didn’t they? Or did they and they are just not admitting it?). After using both Firefox and Chrome I can honestly see no need to return to Internet Explorer, it just feels old. Perhaps there is a need to really strip Internet Explorer back and make a really simple and secure version which is really what most people need. The problem in this business is once you fall behind it normally takes a monumental improvement in a product to catch up as it has to be so much better than what is already out there to even warrant attention. Personally, I can’t see Microsoft doing this. They have reached middle age and a technical leap of that size just doesn’t seem possible to them any more. If the browser is the default application through which which most people access the web how many of these are unpatched and insecure? Even if you are up to date all these unpatched systems still represent a threat because when you are connected to the web you are also connecting to them. The joys of an interconnected world! So what is your browser of choice? Whatever it is make sure it is up to date (as well as your version of Adobe Acrobat). both work fine. The major issue seems to be with Outlook. Interesting that Microsoft Outlook does read Microsoft SharePoint correctly eh? I do have it on my list of things to look at if I get a chance but I am still pondering whether I should move this blog into my updated www.ciaops.com web site. Still mulling that one over. The other day my optical mouse decided to pack up. As you can probably appreciate it is pretty hard to work a PC these days without a mouse. Of course I didn’t have a spare so I took a walk down to the local PC shop. Now I had passed the store many times but never actually gone inside so I was intrigued to see what it was like. The staff were friend enough and pointed me towards a suitable replacement mouse. As I was paying for it I started to ask about their business, how it was going. I told them that I was in IT and so on and so on. The reaction I received was basically, here’s you receipt, have a nice day, goodbye. Now, sure I didn’t buy the most expensive item in the shop but is that much trouble to engage with someone who maybe an opportunity for your business? I’d shown some interest in who and what they were and basically I got totally shut down. Thank you, have a nice day. I started to think about the wider circle of IT people that I know, who typically run their own business and most are quite the opposite. However, that is probably because of a relationship that has been built up over a number of years. When I think about some IT businesses that are acquaintances it made me realize that many of them are like my local PC shop, all they seem to be apparently interested in is their own business. Maybe they have seen too many tire kickers to be bothered any more but most smaller businesses would tell you that receive most of their business through referrals. Typically these referrals are not a direct connection they are a friend of a friend. It would seem to me that the more contacts you can foster the better your chances of picking up business. I myself have been guilty of believing that customers choose you because they admire your knowledge or what you are technically capable of. The reality is that customers give you the business because they ‘like’ you more the next business. They get some sort emotional gut reaction which tells them that this person is worth doing businesses with. Irrational and illogical it maybe but if you stop and think about your interactions with businesses you deal with (provided you have a choice) they you tend to go with the one you ‘like’. In many cases you can’t definitively say what you ‘like’ but you have a ‘gut’ feeling and that has a surprising amount of sway when it comes to making a decision. Perhaps the point that I’m finally coming to realize after all these years is that business is more about person relationships, gut feelings and perceptions than anything rational. I think the road to success is at least partially paved with firstly understanding this and secondly utilizing it. Maybe a good investment in your business is to get to know your peers better or perhaps getting to know people who aren’t your peers and exploring outside your normal boundaries. How will you treat the next unknown that ‘walks into your shop’? After this experience of mine I’m certainly going to try and be more engaging and attempt to build some sort of relationship. Even if they simply end up a Facebook friend you just never know do you? I want to get a better idea of what the people who actually read this blog think is good and think is bad. You can of course always send me feedback directly via director@ciaops.com, however at the very least I’d ask you to complete the anonymous survey to give a better idea of you’re after. As always I appreciate you taking the time to read this blog and I thank in advance for completing the anonymous survey. Today I received the feedback from my presentation at SMB Nation in October 2009 so I thought I’d share it here. – Go Longer- Great Content! – Robert is a very effective speaker and he has a great command of SharePoint. Even though I sat in on his presentation last year, I still learned a lot more about SharePoint this year. I gotta say that I’m stoked with the positive feedback. Thanks to everyone who attended and took the time to comment. Feedback really helps me ensure that my presentations are hitting the mark and providing value for those that attend. You are never sure when you are preparing your presentation just how it will be received so it is nice to hear. There were plenty of suggestions about running some form of workshop on SharePoint next year and I’ll try and propose that when submissions roll around again this year. I’ll have a think about what else I could offer SMB Nation attendees (provided I get the gig of course). Again, to all those who attended my presentation, took time to provide feedback and to SMB Nation for providing me the opportunity to present many thanks. I hopefully look forward to providing something even better this year. My question is, doesn’t that perhaps also apply to computer usage? How many of us spend more than four hours behind a screen, sitting in the same chair everyday? Now imagine if you went from your chair in front of a computer to a chair in front of TV. You would certainly seem to significantly shorten your life span doing just that wouldn’t you? This means that you need to make sure you move around a bit at the office and in front of the TV. The article recommends that you get up and move around every 20 minutes or so. I’m off to do just that now. I must say that I am very impressed with what Mailchimp has to offer. So far I have only taken advantage of their free services (which are extensive), but I can potentially see me taking up their paid options. In the past I have used Constant Contact for this sort of thing but Mailchimp seems to offer a whole lot more for less. Obviously, this is my first attempt at an email newsletter using Mailchimp so there are going to be some rough edges while I work out the full functionality and get the content right. I’m relying on readers to tell me what works and what doesn’t and I’ll adjust from there. I’m really interested to see what people say as I receive a whole swag of email newsletters everyday and most I have to say I delete without even looking at. 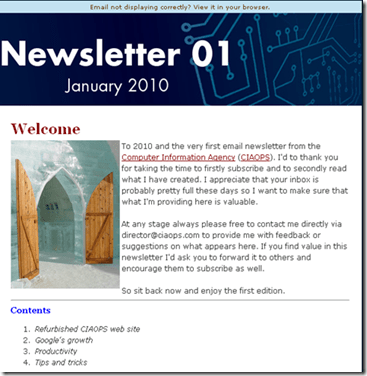 I hope to be able to release a newsletter at least once every month and to ensure that it includes plenty of value for readers (as I would like people to read it). So much so that I also hope they’ll pass it onto others who will in turn subscribe. All in all I’m very interested to see how this progresses as a marketing exercise given the number of email newsletters people already receive. However, from what I’ve found Mailchimp seems to give me the best tools to achieve what I’m after. So please subscribe, have a look and give me your feedback (director@ciaops.com) as I really want to understand how to create something people actually read! I’ve upload the first 8 minutes or so of today’s SharePoint webinar to my YouTube channel as a bit of a preview for those who are interested. <img src="http://lh6.ggpht.com/-j6TV3F8608Y/UPTNIa14yII/AAAAAAAAHRo/bLHPsnDgDdE/videobd9e4f05b6a8%25255B5%25255D.jpg?imgmax=800" style="border-style: none" galleryimg="no" onload="var downlevelDiv = document.getElementById('38ec9ef4-4de9-406b-bad5-235807d1b681'); downlevelDiv.innerHTML = "
The full video is available for download by attendees upon completion of a short email survey. For those people that didn’t attend you can still purchase the webinar download via director@ciaops.com. Any of the previous webinars are available either on YouTube (in parts due to the 10 minute upload restriction) or download via director@ciaops.com. Subscribers to the Windows SharePoint Operations Guide always receive free access to the webinars live or on download (another great reason to subscribe!). Look out for another webinar in about 2 weeks, the details will be posted to this blog soon.